The following Student Achievers have all been trained at Little Artists. Please join us in congratulating them! To learn more about the Portfolio Preparation program (Secondary school / SOTA / College / University) please click here. 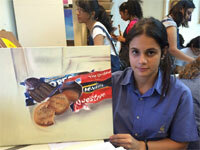 Alekhya Raghavan University of British Columbia (Canada) for Bachelor of Fine Arts. Also admitted to the Savannah College of Art and Design. Mithalina Taib Accepted in SOTA 2013-School of The Arts, Singapore. Jeanette Yong Accepted in SOTA 2013-School of The Arts, Singapore. Jordan Zachary Neo Accepted in SOTA 2013-School of The Arts, Singapore. Khusi Kasliwal Accepted in SOTA 2013-School of The Arts, Singapore. Han Jiwahn Accepted in SOTA 2013-School of The Arts, Singapore. Nadra Ahmed Accepted in SOTA 2013-School of The Arts, Singapore. Siske Loggie Accepted in SOTA 2013-School of The Arts, Singapore. of study at Little Artists 5 years. study at Little Artists 5 years. Arts. Period of study at Little Artists 7 years. Bachelor of Arts, Design & Architecture. Marika Wolf Accepted at Royal Art College London.